The automatic Aero feature in Windows 8 is perhaps the only additional feature for themes when we compare it to what’s available on Windows 7. While this is not a major addition, it sure is quite a useful feature. The automatic Aero setting changes the Aero color as per your current wallpaper. The Aero color is calculated as the average of all the colors present on your wallpaper. Now, though this is a new feature and a useful one, there is no option to customize your Aero settings. You have no option to change or control the way the automatic Aero settings work. This feature of Windows 8 was rumored since long and inspired by this, a developer has created AeroRainbow – an application to control the Aero color on your Windows 7 system. 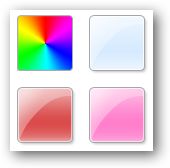 AeroRainbow is an Aero color changer utility for Windows 7 where you can set up the way the Aero color changes on your desktop. There are various options to choose from and you can have the setting as per your preference. This is a cool tool that goes quite well with the Windows 7 Themes and is a recommended download. 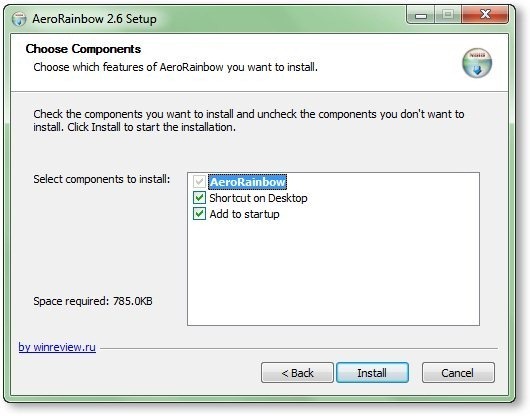 AeroRainbow is a small utility and the installation is not difficult. Run the installer and proceed as per the directions on the screen. Select the components that you wish to install the application. ‘Add to startup’ creates a start menu entry. If you choose to add ‘Shortcut on Desktop’, the application adds three icons to the desktop – one each for Start, Close and Settings. Once you are finished with the setup, the AeroRainbow icon is added to the taskbar for quick access. Click on the AeroRainbow icon in the taskbar and a window pops up that shows the current and next Aero color. Right click on the taskbar icon to select the next color, configure the application settings, see application info, online help or close AeroRainbow. AeroRainbow is simple to configure and allows you to choose from various settings as shown below. Always random color: A random Aero color is applied periodically. Use the colors list: The colors of your choice apply to Aero periodically. Use wallpaper as a color source: Your current wallpaper is used as a source of color to calculate the dominant or average color. 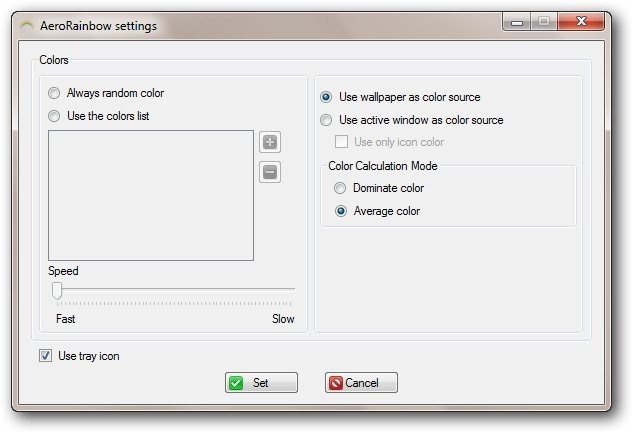 Use active windows as a color source: The colors present in your currently active window are used to calculate Aero color. There is also the option to use only the icons in the currently active window for Aero color calculation. 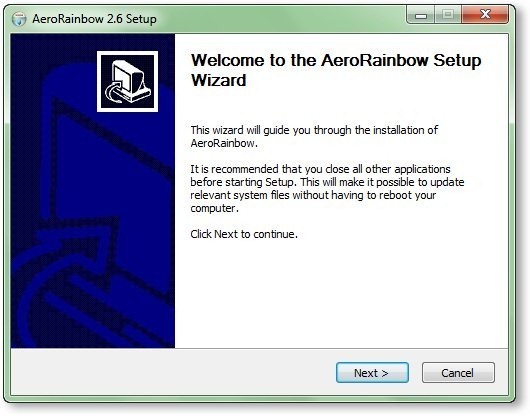 AeroRainbow is a useful utility that takes care of your Aero settings for an enhanced Aero experience on your Windows 7 systems. When used with windows 7 themes, it gives a smoother look to the desktop as the Aero color matches the overall color of the desktop wallpaper. The above-shown settings should go nicely with our windows 7 themes, and we recommend that you try out this utility! Check out a few more apps that let you customize your Windows 7 OS here.